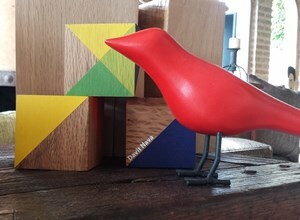 Red Birdie and cubes made out of post-natural-disaster wood. If you are interested in buying my artwork, contact me by email or visit the stores and galleries listed below. Absolut Chameleon (2016), post-use material, air hardening clay and glass beads. Photo by Eugenio Morales. In Portfolio and on my Instagram account you will find more images of my artwork.